When I went to pick up Lauren from Sunday School this week, I was greeted with good news: Lauren went to the bathroom for one of the teachers! Though I did praise Lauren for the accomplishment, I shared a different sentiment with the teacher. I was so glad my daughter went for her, and Lauren will almost always go for my husband Matt, but she usually fights me. I’m sure my frustration was palpable. Why them and not me? It struck me on the way home that I often treat God the same way. When an issue is weighing on my mind, I talk about it to my husband and maybe to my mom or a friend. When something is driving me crazy, I might dish with a bystander. When I’ve had a bad day, everyone else is aware. When something wonderful happens or my kids do something super cute, I immediate upload the photo to Facebook or text my husband to share. But do I go to my Heavenly Father in the process? Is He the first and primary person I go to? Sadly, I think God is often left asking the same question I get frustrated with Lauren about: Why not me? I spend more time with Lauren than anyone else. My full-time job is taking care of our family, and Lauren and I spend the bulk of our day together. You would think that would warrant a better response when it comes to potty-training. Yet, I get more screaming, tears and tantrums than anyone else when it comes to working on this particular skill. 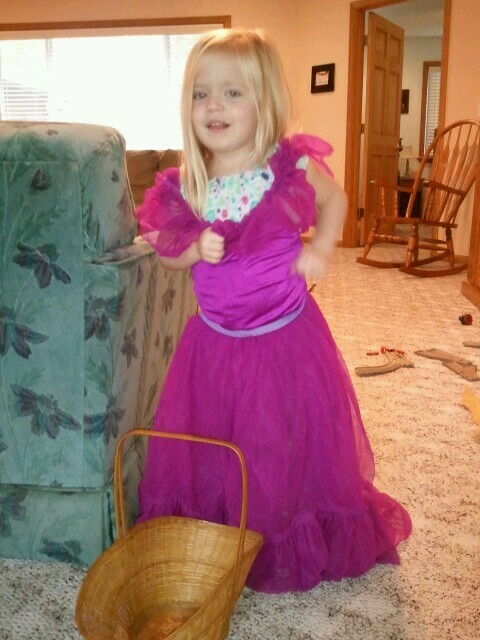 Potty-training can become very interesting while playing dress-up. God spends more time with me than anyone else does. He promised me He would never leave me or forsake me, so He is always there. We spend every moment together. You would think that would result in a different response during challenges and frustrations, or moments of joy. Yet, I am sure God experiences more attitude from me than anyone else sees. In a strange way, my plight with Lauren is making me more aware of how I relate with Jesus throughout the day. Now, it’s going to be hard for me not to think of my Savior and pray to Him during the struggles I have with my daughter in the bathroom. And, despite my failures, I want Lauren to see God’s grace and enduring patience as I help her through this process. Tagged: grace, patience, potty-training, prayer, Why not me?